If you like mountains, you'll love Ripollès. 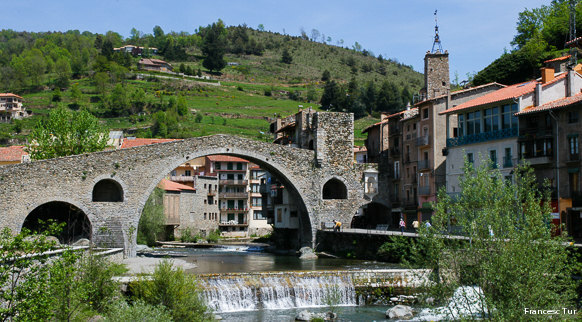 It's one of the counties in the Girona Pyrenees, where the terrain reaches heights of almost 3,000 metres with peaks such as Puigmal or Bastiments. Idyllic landscapes are all around you; in the valleys of Camprodon, Ribes or Núria you'll be constantly amazed by the local nature. If you're keen to discover the area's past, you can travel back to the origins of Catalonia at the Romanesque monastery of Santa Maria de Ripoll, while towns such as Sant Joan de les Abadesses, Beget, Campdevànol or Gombrèn–Montgrony are crammed with historical and cultural landmarks. If you like good food, you'll leave the county with a great taste in your mouth thanks to its wonderful gastronomy. And if keeping active is your thing, welcome to paradise: skiing, mountain biking, hiking and plenty of adventure to get away from it all.